I just had to write it down, (or type it up) didn’t I? I had to go and call this house A Manor of Reading — and, if I’m honest, I was quite pleased with the name — but Pittleworth has reacted as if it had been written into being by J K Rowling; I’m thinking of the Gemino curse in Gringot’s bank, where whatever you touch in the cursed vault relentlessly replicates itself, eventually crushing the interloper to death. You see, I am sorting out The Books and it is no comfort at all to know that I have largely bought this on myself. We are in the middle of the bizarre process of moving house within a house (I’ll explain this properly in another post, I’m feeling too feeble at moment) and the removal men were with us yesterday. The dining room table is upside down, there are three beds piled on top of one another in our old bedroom. Another bedroom door utterly refuses to shut. I have clothes all over the place (and, to add insult to injury, few of them are wearable) but the real problem is the books. They are EVERYWHERE. My husband and I have spent the last eight years living in a flat in the attics and attics, it turns out, are simply marvellous places for stockpiling books, especially if said attics haven’t a right angle in them: providing useful spaces behind sofas and in corners where books can pile up and quietly pursue their biblio-breeding programs (I’m sure I never bought quite so many biographies, though I have a treacherous memory of having read most of them at one time or another). Our attics also encouraged us to build book shelves (well, in point of fact, P — who spends a lot of time banging this house back together, he will feature quite a lot in these posts — built them). Nearly all the ceilings slope from waist height, picture-hanging was not an option. So we went with the dictum ‘books do furnish a room’ and had waist-high book shelves along any spare walls to produce a bit of colour. This did nothing to discourage book accumulation, mainly by me. And now we are moving downstairs (which was not exactly under-burdened with books to start with) and these books have to come too because the nursery contingent is spreading through the attics and the twins (20 months) are inclined to view bookshelves as a joyous opportunity for climbing and discus practice. We spent considerable time and effort teaching them to put books back on the shelves and we have been most successful: they like putting books back on shelves, but of course you have to take books off shelves in order to put them back. That’s logic. So there are books all along the upstairs passage (which is long). Every flat surface in guest rooms is piled with reading matter. So are the bathrooms and don’t get me started on our bedroom. Husband placed his beautiful hardback collection on the chest of drawers in one easy movement (he’s very strong) adjusted them slightly so they were dead on centre and then looked on as I was engulfed in literary landslide while trying to get round to my side of the bed. There was no question which was my side of the bed: It was the side next to the bookcase. I had it filled in ten minutes. 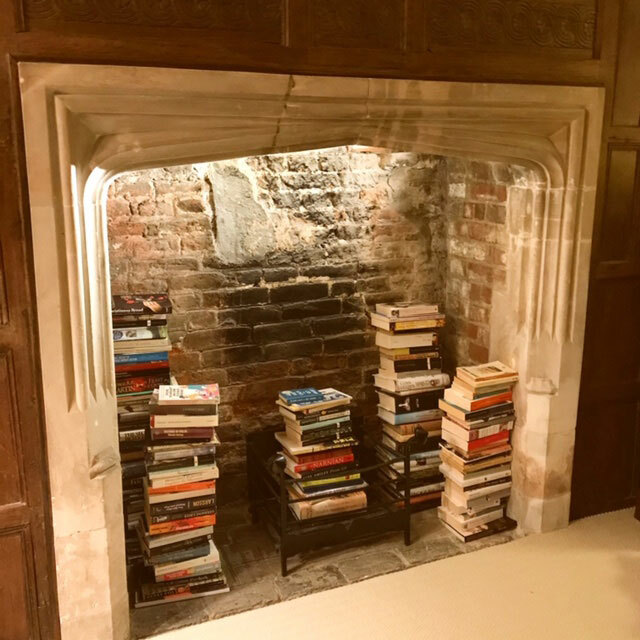 “How do you feel about books in the fireplace?” I asked Husband. His eyebrows shot up hopefully. “for decoration,” I added firmly. It may not surprise you to know that I am writing this post over several days and (rather more surprisingly) some sort of order has now prevailed. There are still books everywhere, every window sill has some, bedside tables in the guest rooms groan. But to the charitable soul, in a poor light, they sort of look as if they are supposed to be there. A Manor of Reading! Trade Descriptions Act, do your worst. But now another problem looms; I shall now have to organise these books. Some sort of categorisation is clearly called for. Now I know you are out there: the artists of bookstagram and you do beautiful, artistic — sometimes colour-coordinated — things with books. I admire you, I love what you do and look forward to your posts but, I also admire the Rose Adagio in the ballet of Sleeping Beauty — and I’m not doing that either. I once prided myself on my memory for where books were (then I had children: nuff said). I saw the house as a sort of giant memory palace and I found it easy to remember where books were in a particular space. But now, on top of Mummy memory, there is the inconvenient fact of having moved hundreds of books at once and there the whole smug concept of a Pittleworth memory palace comes crashing down (it certainly did in the end spare room: we thought the floor had gone but it was just books). I shall have to get systematic and I am the sort of person who thinks that ‘systematic’ is a Serbian nun. I suppose it could help with the names of rooms. I can’t go on calling the bedroom next to ours ‘my mother’s room’ and several of the bedrooms are basically green but you can’t start talking about the ‘sage room’ and the ‘eau de nil room’ (not if you still want friends to invite there). Mind you, I suppose the ‘biography room’ and the ‘history room’ are even worse really and the ‘post-war fiction room’ does not exactly roll off the tongue. No, better keep those as private nomenclature. But I think I’ve started to write my way through the problem. I used to appreciate the semi-chaos of disorganized books. But it got so that I couldn’t remember what I had, and kept re-buying books I already owned (my students, the recipients of my duplicates, loved this). Also I have books in 3 different cities, including one on another continent! So finally I decided to catalogue them all, using LibraryThing.com. I give each book a category tag that tells me, roughly, where to find it. I did most of the cataloging while I was moving, which worked pretty well. I now feel less overwhelmed.